The 2014-15 New York Rangers will look to recreate the magic that led them to the Stanley Cup Finals last season. After having a rough start to the season with new head coach Alain Vigneault at the helm, the Rangers went on a magical run that no one saw coming. There were even talks during the season of having back up Goaltender Cam Talbot becoming the starter because of Henrik Lundqvist’s poor play. However, Lundqvist returned to his true form that gained him the moniker of “The King.” A rare midseason trade of captains between the Rangers and Lightning saw fan favorite Ryan Callahan sent to Tampa Bay for Martin St. Louis. St. Louis struggled during the season scoring only 1 goal. The Rangers still made the playoffs with strong play from Mats Zuccarello, Chris Kreider, Brian Boyle, Dominic Moore, and Ryan McDonagh to name a few. The Rangers defeated the Philadelphia Flyers in 7 games setting up a round 2 matchup with Sidney Crosby and the Pittsburgh Penguins. After being down 3-1 in the series the Rangers made a miraculous comeback, led by Martin St. Louis, to win the series in 7. In the Eastern Conference Final the Rangers took care of the Montreal Canadiens to advance to the Stanley Cup Finals, where they would eventually fall to a stronger team in the Los Angeles Kings. It is never easy getting over a loss in the Finals and the odds will be stacked against the Rangers, especially considering the lack of success teams have had in the past when it comes to returning to the Stanley Cup Finals. The Rangers will look different this season when it comes to the roster. After buying out Brad Richards, they lost Brian Boyle, Benoit Pouliot, and Anton Stralman to free agency. The biggest loss out of all of these players has to be Brian Boyle. Factor in Richards buyout and Derek Stepan being put on IR with a broken fibula, the Rangers now lack depth at the Center position. Look for the Rangers to make a trade to bring in a center during the season. The Rangers resigned Mats Zuccarello and Dominic Moore who had stellar seasons, but the biggest addition to the team has to be Dan Boyle. He will most likely play on the defensive line with Marc Staal. His best attribute will come during the power play, which the Rangers look to improve on. Boyle is a great offensive defenseman. As stated before, The Rangers biggest weakness is at center. Derek Stepan will take about a month and a half to return from IR. Until then the Rangers will have to count on Martin St. Louis and Dominic Moore to hold down the fort at center. The Rangers speed and youth will be on display this season. It was a key factor into them reaching the Stanley Cup Finals. With the speedy Carl Hagelin leading the charge alongside Chris Kreider, Rangers fans should be excited. They should also be excited because the Rangers are getting younger and that is most evident with the additions of forwards Anthony Duclair and Kevin Hayes. Look to see these two make a nice impact for the team. The Defense will look to continue its strong play with Ryan McDonagh, Dan Girardi, Marc Staal, Dan Boyle, John Moore, and Kevin Klein. Lets also not forget who is in goal. Henrik Lundqvist is the man in goal and there are not enough words to express what he means to this team. Cam Talbot will back him up to make a great goalie tandem. 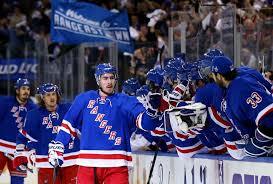 The player to watch out for is none other than the new Captain, Ryan McDonagh. We all know how great of a defenseman McDonagh is. Look to see him evolve even more as he takes reign as the 27th captain in Rangers history. He will be a force in the lineup for seasons to come. A lot of people will think the Rangers will suffer from a Stanley Cup hangover. Alain Vigneault has slowly put together his kind of team. Look for the Rangers to improve under Vigneault’s system. Although they lack depth at Center, I think they still have what it takes to make the playoffs. Remember once you make it to the playoffs in the NHL anything could happen!